To be fair, that book was written over 50 years ago. When the book author looks at early human actions and deem them as merely functional and geared towards survival, he creates a barrier that makes it difficult for us to relate to our ancestors. It’s as if they were a different species, when in fact they were anatomically exactly the same as we are today. An example of Rock Art found at Serra da Capivara site in Brazil. Photo by the author. Paleolithic art, traced back to 40,000 years, was preserved in the form of sculptures, paintings and carvings, composing a vast cultural portfolio that was present in early-humans daily lives. The repetition of motifs in different locations and surfaces, as well as in decorative objects, weapons, utensils, and sculptures (female representations measuring 2-5 inches). The figurative and graphical representations lead researchers to believe that the art carried meaning; a meaning that was shared among the individuals of that community. The substantial amount of effort needed for the artistic representations points at the significance it held for the ones involved. 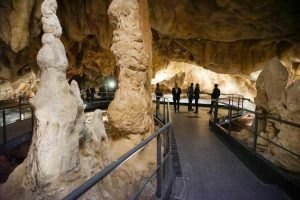 When museum visitors look at the replica cave in Chauvet, they feel closer to the lives of their ancestors who created art that represents their culture and reality. Similarly, with a visit to an anthropology museum we face that ancestor, interacting with daily life’s beauty and challenges just like any of us. 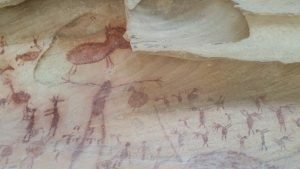 The peculiarities of environment and geography influence the characteristics of Rock Art. The wall paintings in depths of cave where the light does not reach – were found in northwest Europe for at least 20,000 years. 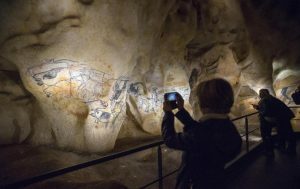 Paintings in rock walls, rock shelters, and shallow caves have been found in archaeological sites all over the world, dated from 35000 to 12000 BC, (same link) The early-human explorers who spread out left their signature paintings in France, Spain, Brazil, Argentina, Indonesia, and many others. However, the style of the artistic representations vary with the location or even within the same location. This diversity leads us to believe that, like today, a cultural diversity already existed in early humans. Even though the representations are diverse, they also indicate a common theme: different individuals, from unique environments, separated by thousands of miles or years, all had the same idea – use rock walls as a canvas to display and share their ideas and beliefs. These findings allow us to see the past in a more complex and even poetic way – like the woman and her backpack in the beginning of this story – facets that are completely lost in the traditional Art textbook. Andrea Russo is a researcher in Education/Digital Art and Art History specialist.